Cornell College Mock Trial is headed back to the National Championship Tournament in Philadelphia on April 4, 2019. March 8–10, The team finished the Opening Round Championship tournament in Cedar Rapids with a record of six wins and two losses to finish in third out of 24 teams, earning one of only five bids awarded to the National Tournament. In addition to the team success, Cornell’s Jack Beaumaster ’20 received the Outstanding Attorney award and Jack Bressett ’21 received the Outstanding Witness award. 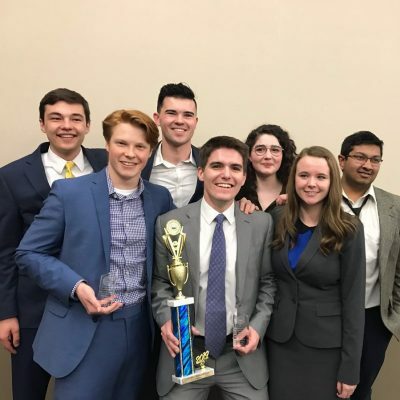 The American Mock Trial Association (AMTA) only allows colleges to accept up to two bids, and, now, one of Cornell’s three teams are getting ready to show their skills at Nationals. Mock trial competitions are not tiered like intercollegiate athletics, so Cornell competes against all types of schools during its season. Cornell will join a host of other schools at Nationals, most of which are Division 1 schools, including Yale University, Stanford University, Ohio State University, Georgetown University, Duke University, and UCLA. Cornell College Mock Trial has had tremendous success since its founding in 2006. The team has qualified for the AMTA National Championship Tournament in 2009, 2010, and from 2013 through 2016. Mock trial is an intercollegiate activity that combines speech, theatre, and debate. Cornell’s mock trial program gives students the chance to develop a better understanding of the courtroom process and the American legal system. The primary objectives of Cornell’s mock trial program are to enhance each student’s critical thinking, analysis of logic, and public speaking skills in a competitive and collegial environment. Participation in the mock trial program is open to all Cornell students, regardless of academic major or prior mock trial experience.